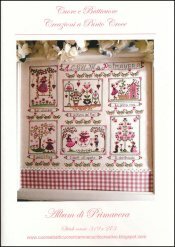 Album di Primavera [G1477] - $18.34 : Yarn Tree, Your wholesale source for cross stitch supplies. Cross stitch pattern by Cuore e Batticuore. Stitched to look like a page out of a photo album. Six photos of spring time memories. Stitch count 319 x 273. Stitched on #2235 Edinburgh Linen cream.